This brochure contains great information on school bus safety, everything from safety tips for students on the bus, safe boarding procedures, and information on passing school buses while they're stopped at school bus stops. It is formatted as a tri-fold brochure. Parents, please remind your children who ride the bus to buckle their seat belts on the bus and leave them buckled for the entire bus ride. The school bus is the safest vehicle on the road, but in in the event of a rollover, students who are not buckled in their seat belts are vulnerable to injury. PENSACOLA, Fla. - It's a campaign to address a major safety issue in school buses. PENSACOLA, Fla. (WEAR) — It's the first week of school and that means school buses are joining you on the road. Transportation director Rob Doss of Escambia County school district keeps all the wheels turning at the Escambia County School District. The August 2015 edition of School Bus Fleet magazine includes an article entitled "6 Ways to Instill Safety Culture Among Drivers" in which one of the reasons for the Escambia County School District's school bus safety success is discussed. The article focuses on the importance of a solid safety culture in organizations, but everyone knows success relies on the extent to which professionals within the organization embrace that culture. It's important to remember that organizations generally succeed because of what they do; forward-thinking organizations, however, also recognize that they sometimes succeed in spite of their mistakes. Honest recognition of those shortcomings is the only way to keep the success coming. Do you know when to brake for that big yellow school bus? Knowing the rules could save you from a crash but more importantly, from striking a child with your vehicle. No one wants to do that. So, what are the rules of the road when it comes to stopped school buses on Florida's roadways? Motorists moving in both directions must stop when approaching a school bus with its lights activated and the stop sign extended. However, on a highway divided by a raised barrier or an unpaved median that is at least five-feet wide, a motorist traveling in the opposite direction of the stopped school bus may proceed with caution. That means the ONLY time we don't stop for a school bus that has its lights activated is when we are on the other side of a raised barrier or five-foot unpaved median, headed in the opposite direction of the bus. Even then, we proceed with caution. Florida's departments of Highway Safety and Motor Vehicles, Transportation, and Education have teamed up to develop Stop on Red, Kids Ahead, a statewide education campaign to remind motorists of the laws and safe practices to take when approaching a school bus. FloridaSchoolBusSafety.gov serves as the information portal for the campaign. Students should always be aware of the "avoid" areas near a school bus. 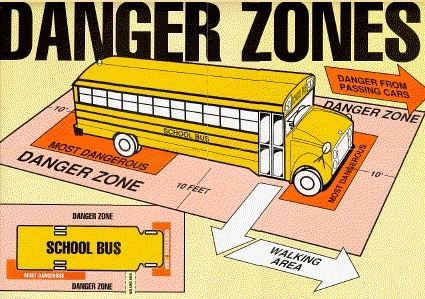 These "avoid" areas are the zones where the school bus operator has limited visibility. Students should always board the bus from the front and remain in the view of the bus operator. When the bus begins to pull away from the bus stop, students should not chase after the bus. 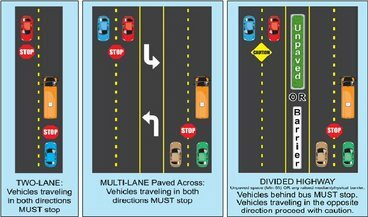 Do you know when you can pass a school bus while it is stopped at a school bus stop? This diagram explains it all.